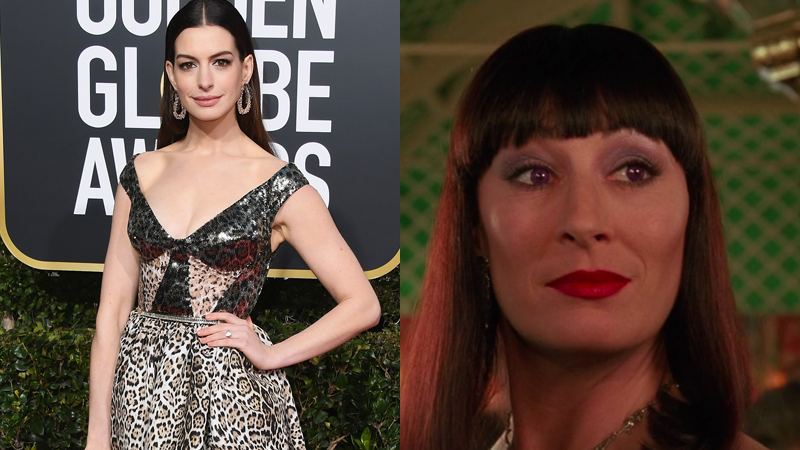 Anne Hathaway, seen at the Golden Globes last week, is taking on the role Anjelica Huston played in a retelling of The Witches. Photo: Jon Kopaloff/Getty Images and Warner Bros.
Few actresses can follow Anjelica Huston, but Anne Hathaway is going to try. The Oscar winner just closed a deal to star as the Grand High Witch in Robert Zemeckis’ adaptation of Roald Dahl’s The Witches. Though Hathaway had been circling the role for a few weeks due to scheduling, Variety reports the deal is now closed. Zemeckis is writing the script and Oscar winners Alfonso Cuarón and Guillermo del Toro are among the producers. It’s a very impressive team. The Witches is the kind of fantasy/horror/family blend that Zemeckis is well known for and, coming off the disaster that was Welcome to Marwen, the director of Back to the Future and Forrest Gump needs a win. Adding Hathaway, who is quickly becoming one of the most famous and capable actors of her generation, is a strong start.